Outside the United States the name Jim Delligatti likely won’t mean anything in connection to the global fast-food chain McDonald’s. Stateside on the other hand would probably have an inkling of his significance, especially if they happen to live in or close enough to the Pittsburgh area. See, back in the 1960s Delligatti was a franchisee of McDonald’s, starting in nearby Uniontown a decade before but grown larger since. It was that time when he had a brainstorm on a new menu item for his franchised restaurants, which later became a staple of the brand as a whole. 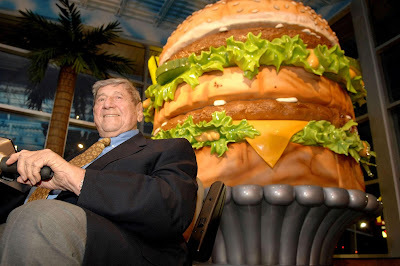 Jim Delligatti “created” the Big Mac. And as told in The Wall Street Journal, this pioneer of a sort died at his home at the Pittsburgh suburb of Fox Chapel. He was 98 years old. The story goes that Delligatti first conceived the Big Mac in 1965. It was for its time a monster of a burger with double-decker large beef patties, a sauce that is a tad tangy from the run-of- the-mill McDonald’s burger then, all topped with lettuce, cheese, pickles and onions, slotted into a three-layer large bun with sesame seeds. He first tried it out to customers at his Uniontown McDonald’s, selling at 45 cents a pop (now at a “punishing” $5). Reception was so good that a year later all McDonald’s restaurants were serving the Big Mac, and it’s been the face of the franchise menu ever since. But if someone had asked Delligatti about it then, he wouldn’t claim himself to be an innovator who created something original to boost sales for his franchised restaurants – though it did and more so for the brand. He had freely admitted that the Big Mac was a rip-off of the double-decker burgers being sold by other rival burger-centered fast-food chains actively competing with McDonald’s in those days. In 1993 he described the circumstances thus, “This wasn’t like discovering the light bulb. The bulb was already there. All I did was screw it in the socket.” Self-effacement aside, Delligatti’s flight of fancy eventually became something huge and iconic as he would say at another time,"I would never have dreamed that my creation would turn into a piece of Americana." McDonald’s would quote the Big Mac creator in a tribute Tweet they posted in honor of Delligatti’s contribution and memory. Believe it or not, Jim Delligatti had not been the only McDonald’s franchise-holder to have come up with a distinctive snack that would become a menu regular like the Big Mac. Franchisees are also to thank for coming up with stuff like the Filet-O- Fish and the Egg McMuffin. But at the head of them all has always been the Big Mac; McDonald’s claims that the basic recipe as done by Delligatti in 1967 has never been changed.